I'm starting to wonder how many people properly understand this hand signal. 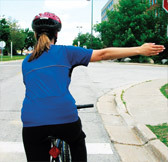 I have witnessed two different cyclists signal with the first method only to turn left over the last couple of years. When I use it (correctly) many motorists just stare at me, stopped, and wait to see what I'm going to do. Either they don't trust that I know what it means (which is a little insulting, but not totally unreasonable) or they don't know what it means themselves. As a result, I have begun using the second signal more often. I am experiencing less "lack of faith" from motorists, since there is little room for misinterpretation of the signal. The bummer is that I have my front brake lever on the right side on two of my bikes, partly because it allows me to apply my stronger brake while signalling the first way. Ah well. I will sacrifice that convenience for better communication, I guess, and if I need more brake, I'll just do it the old way again. I know this is fascinating stuff. I hope your excitement level hasn't gone through the roof and freaked you out or anything. Out of curiosity, though, how do you normally signal a right? It fried my brain for just half a second and for some unknown reason I wanted to share it with you too. That guy in the ad is doing the "mess with your head" bicycle signal, I guess. I signal by pointing in the direction I intend to turn. Clear and simple. Frankly, I think the crooked-elbow signal is a bit quaint and old-timey and, as you suggest, a bit more difficult for fellow road users to understand. I think it makes sense to retire a signal that does not send a clear signal in favor of one that does. I use the right arm to signal right. Around here (Orlando), not only do some motorists and cyclists not understand the upraised left arm, some don't even understand the extended left arm for a left turn. On at least three occasions I've had a motorist attempt to pass me on the left while I was clearly and emphatically signaling a left turn into my driveway. I used to do the left-hand signal, but transitioned to the right-hand one some time ago. now I just point whichever way I'm going, with the respective arm. I seem to get a lot less confusion from other road users this way. I dont expect the drivers to have any clue what I'm doing. Wouldn't it be more obvious (to the drivers) to use your left, sticking out into the lane kinda like taking the lane with your arm? Mighk - Well, you're obviusly just insane for being in the road at all. What crazy things you do with your arms is irrelevant. Apertome - Same as me! Yahoo! I think as long as your signalling with either hand, its great. Personally I use my left arm only, keeping my right hand ready to use for the rear brake. Using the crooked left arm to signal a right turn was developed for drivers as extending the right arm couldn't be seen outside of the car (and as you would hit your passenger in the nose). 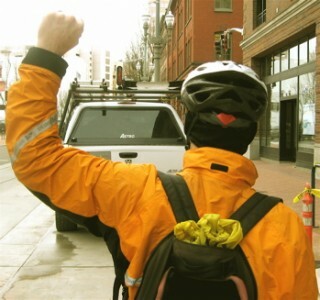 On a bike, using the right arm to point your direction makes way more sense. Of course, the reality is that 90% of motorists aren't paying enough attention to see the signal, don't know what it means (either of them) or just don't care. Go back and read my August 23 post. Your guy in the photo is, according to cafiend, missing a finger. After trying it your way, I went back to the "alternate" RT signal and just cut it off if I need more braking power. I point the way I intend to turn (I gave up the left arm only approach when I lived to a drive on the left country 15 yrs ago). 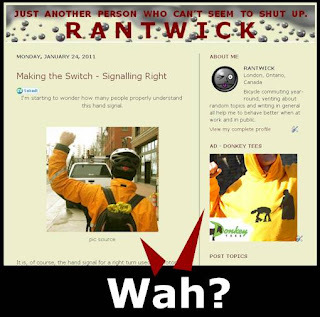 Sometime a couple years ago I hollared at a cyclist for blowing through a red light I was dutifully waiting at. I passed him a couple blocks later (naturally...) and then pointed right for a right turn - he yelled at me for signalling wrong. I point where I'm turning. But Arizona law permits that. I thought you might mention if consideration of what the local traffic code permits to signal right turns is a consideration. PaddyAnne - You're absolutely right, signalling at all is way more important than the method you use! TBCC - Agreed, the right arm is more intuitive, I think. Unless you've been using the left for years as I had. I must disagree about 90% of drivers not noticing or caring... although I have no proof, I rather think that 90% notice and appreciate the signalling of your intention. Steve - I remember that post. I'm coming to use your right more often, but not always. And no fingers. JAT - Sometimes you just have to shake your head. JRA - I don't know of any North American jurisdictions where the "alternate" right signal is no good... although I am not very well versed or travelled. Yeah, the right arm signal is okay in Texas as well. I used to only use my left arm for signaling. Nut after being chided by my friend The Bike Safety Instructor for my "weak" left hand/right turn signaling technique, I've been mostly doing right hand/right turn. I historically used the crooked-elbow signal as well ... recently, though, after quizzing a few drivers both older than myself and my own age and learning that only two of them could remember the 'traditional' right-turn signal, I adopted a directional-pointing method for similar reasons to Jim's. The worst result I've experienced when using the crooked-arm version was a driver's assumption that I was offering a 'wave around' signal ... very disconcerting. I've encountered no such issue with the point-n-turn method, thus far. I was pleased to learn that NH considers the right-armed right turn signal legal and proper for bicyclists and motorcyclists. I was doing it that way anyway.